I'm going to do my best to avoid spoilers of both Anna Dressed in Blood and Girl of Nightmares, but just in case spoiler potential would keep you from reading my review(s), here's the gist: You should go buy these. Even if you don't like horror, even if you don't like urban legends, even if you don't like YA or romance or contemporary or mysteries or ghost stories and gore, or any of the things that make up this book, you should really have these on your shelves. Or better yet, in your hands. I'm not even kidding, and I rarely tell people to buy things. But this is for serious. Remember when The Doctor sent Rose through to the other world? That feeling. And it's true, I really did feel sort of bereft, like I had lost something that wasn't coming back. There was no more. This is the end. [See, this is why I am so bad about finishing series'; this is why I've had Monsters of Men, the last book of the Chaos Walking series, sitting on my shelves since May of 2010. I just couldn't...] And it wasn't just the fact that the duology is over that left me feeling this way, but the things that happen; Blake does a commendable job of ripping my heart out, squeezing it a time or two, and then putting it back. Anna would be proud. It's bittersweet and exactly right (see, these are happy tears), and I admire so much that Kendare always gives the right ending, the ending that needs to be, even if it means going some places others would avoid, or giving an ending that might not make all readers happy. 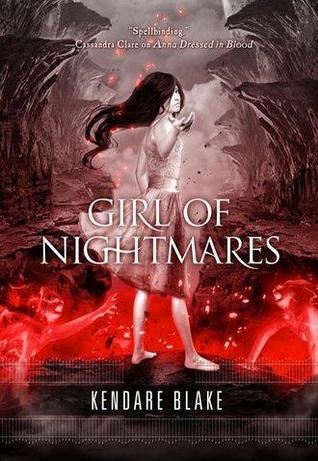 And speaking of new ground, Girl of Nightmares went some places I didn't expect. I mean, I didn't really know what to expect, honestly, but I certainly wasn't expecting what I got. The story and the world is really broadened in this (which could easily be seen as a set-up for future books, which is why I respect even more that it's not - she still took the time to broaden the story and give us something new), and there were resolutions to things that I didn't realize really needed them. All of it together just worked.I did want more Anna, but I think that's just because I'm enamored of her. There's something special about her as a character, and about her relationship with Cas, that you just don't get in other books, and so I couldn't help but want more of that. That being said, at the same time, I couldn't help but think she was in it exactly the right amount. And so, I guess I want to end this the way I began it: I don't generally tell people what to buy. It's your money, waste it on whatever you'd like. But buying the Anna books would be so far from a waste of your money that if you're not in line at the bookstore or adding them to your online shopping cart right now, I have to wonder to myself what you're doing with your life? I mean, you trust me, don't you? Would I lie to you? If you need more convincing, check out my 2nd awesome interview with Kendare! This is a fantastic review :) Yes to everything! I love this book! Wow. I officially HAVE to get this book now. Thanks so much for the review! I always thought that this book looked good but now I'm convinced of its awesomeness. (And the Doctor Who vid/clip made it that much more heartbreaking for me to imagine NOT reading this book..nice choice!) So thank you for finally making that choice for me because I hadn't been sure about this book until now! Wonderful review! Awesome, Nichole! Hope you like it! And that Doctor Who gif...there's a reason, and IT GIVES ME FEELS. OMG Misty, I CAN'T HANDLE THAT FEELING! The unbearable parting? I just can't. I actually really appreciate when authors don't run things into the ground and leave while things are still good--so I'm both excited and sad to start this one (which is sitting on my nightstand calling to me as we speak). I'm so glad you loved it, even if it was hard...(and btw I have a total fear of statues so you can imagine my DW nightmares).